**Recipe and photo owned by Freda's Voice. 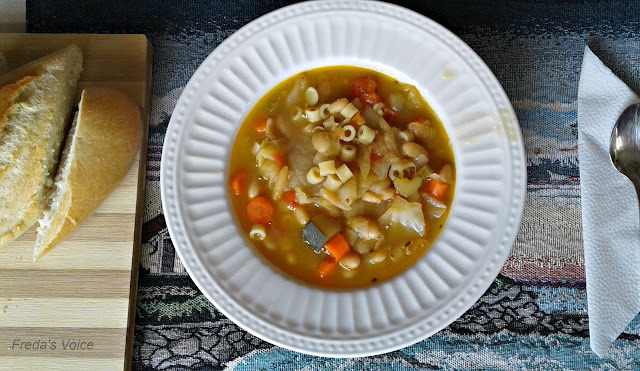 Minestrone soup is one of my favorite soups that my mother-in-law makes, and since moving out of her home and into our own again, I need to figure out what went inside hers so I can make it myself. I'm happy to say I did get it, and the hubster says it is just like hers! That's a compliment!! So here is my rendition of my mother-in-law's soup. Heat the oil in a pot on medium-low heat. Add the onion and garlic, saute until golden. Add tomatoes, stir. Cook 2 minutes. Add zucchini, stir. Cook 1 minute. Add carrots, stir. Cook 1 minute. Add celery, stir. Cook 2 minutes. Add cabbage, stir. Cook 1 minute. Add beans, stir. Then add the stock and stir again. Add thyme leaves, not stalk, salt, pepper and bay leaves. Stir. Bring to a soft boil then cook on medium heat for about 15 minutes till the vegetables are cooked. Add pasta noodles and cook 10 minutes more. Serve with a fresh, warm baguette. It is so yummy and quick to make. Under an hour for all the cooking and prep. Looks good! I like Minestrone soup too! The Minestrone soup looks delicious. I am in the mood for soup. Husband is not. Looks great! Minestrone is one of my favourite soups and your recipe is very like mine, except I don't put zucchini in - my husband doesn't like it - or celery as I'm not keen on that! Sometimes I add sliced leeks.